Andy wants a job as a signalman on the railways. He is told to meet the inspector at the signal box. The inspector puts this question to him: "What would you do if you realised that two trains were heading for each other on the same track?" Andy says, "I would switch the points for one of the trains." "What if the lever broke?" asked the inspector. "Then I'd dash down out of the signal box," said Andy, "and I'd use the manual lever over there." "What if that had been struck by lightning?" 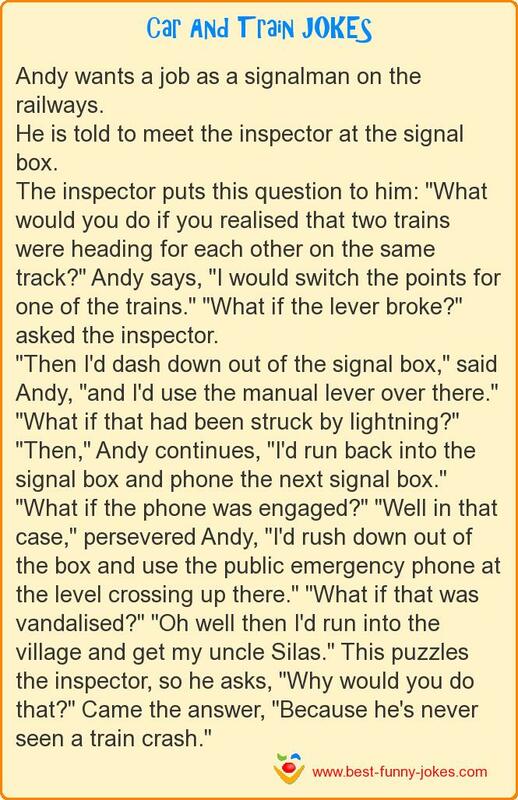 "Then," Andy continues, "I'd run back into the signal box and phone the next signal box." "What if the phone was engaged?" "Well in that case," persevered Andy, "I'd rush down out of the box and use the public emergency phone at the level crossing up there." "What if that was vandalised?" "Oh well then I'd run into the village and get my uncle Silas." This puzzles the inspector, so he asks, "Why would you do that?" Came the answer, "Because he's never seen a train crash."